Padua or Bergamo, Italy, ca. 1450. 19th-century red damask over boards, inside covers have pastedowns of large paper service book leaves with music on 5-line stave. 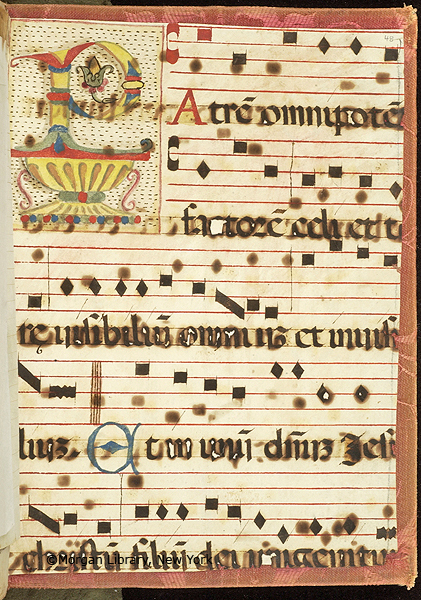 Originally owned or commissioned by the Benedictines of Santa Justina in Piacenza: An inscription as part of the rubric on fol. 2r states in Latin: ISTE LIBER EST MONACHORUM CONGREGATIONIS SANCTE JUSTINE DE PUTATUS FRATRIBUS NOSTRIS MONASTERY SANCTI SIXTI DE PLACENTIA, translated to "This book is the property of the Congregation of St. Justina, assigned to our brothers of the monastery of St. Sixtus in Piacenza. "; Benedictines of St. Sixtus at Piacenza; Cavaleri Collection at Milan (ca. 1840); Richard Bennett (bought July 7, 1897); Catalogue of manuscripts and early printed books from the libraries of William Morris, Richard Bennett, Bertram, fourth Earl of Ashburnham, and other sources, no. 104; purchased by J. Pierpont Morgan (1837-1913) with the Bennett Collection in 1902; J.P. Morgan (1867-1943). Ms. life of St. Benedict; written and illuminated in Italy, perhaps in Padua, ca. 1450. Decoration; 80 miniatures (colored pen drawings by two artists) of varying sizes; 1 historiated initial.